This morning, all any of the sports shows can talk about is the Rams-Saints game last night. A no-call on a pass interference in that crucial game has effectively sent the Rams on to face the Patriots in Super Bowl LIII in two weeks. It’s a match that will be preceded by and surrounded with controversy… like any other Super Bowl. 2018’s Super Bowl LII was also one for the books! Controversy was once again the name of the game. Justin Timberlake sparked controversy when he agreed to perform during the halftime show. CURE Auto Insurance shocked everyone in a commercial that stated: “You know what’s weird? If you cheat on your car insurance, you can get arrested. But if you cheat at football, you can sleep with a supermodel.” A CLEAR shot a Tom Brady and his wife Gisele Bundchen amid the football deflating scandal. On the day of “The Big Game” social media was flooded with die-hard fans’, casual fans’, and party goers’ Super Bowl celebrations. The day after the Super Bowl, people created memes, ranted about the close calls, and and shamelessly stuck by their teams no matter what. One thing I think we all can agree on is that the Super Bowl ads are the one part of the show that never disappoint! All of this is what makes the Super Bowl worth the $5M the American Marketing Association says advertisers were paying for 30-second commercial spots. It’s difficult to find any demographic that has no participation in Super Bowl Sunday. Whether they watch football regularly or not, families are watching, friends are watching, organizations are throwing Super Bowl-related events, fans are tuned in for everything from the pre-game to the post-game show. Partiers are making sure they don’t run low on any snacks or beverages, and socialites are posting their entire day! The Super Bowl is an EVENT where people are actively doing things, buying things, and talking about things on social media. And that’s an ideal environment for smart marketing. The Super Bowl is huge! Like 76 percent of Americans who watch the game. It’s not just the most watched event on American television every year. It is also THE competitive event of the year. Two teams battle it out in a single game - no playoffs, no ‘we’ll get ‘em next times’, no do-overs. One. And. Done. I can't think of a better way to summarize the way the last Big Game ended. In 2017, that “one-and-done” meant the Patriots made history by closing a 28-3 lead by the Falcons in the first ever Super Bowl game to go into overtime. The Patriots won the game 34 to 28 after trailing behind the Falcons in the first three quarters of the game. It was an unbelievable match (because the Patriots closed a 25-point gap in the fourth quarter, and because the Falcons let them)! A year later in Super Bowl LII, one quick-witted defensive end, one overconfident, predictable quarterback, one well-timed sack, one historical fumble recovery. And done! The Philadelphia Eagles secure their first Super Bowl victory. In total there are about 48 million of us who watch the game every year hoping to see magical. breath-taking moments like this. Moments that we can relive, and share with others for years to come.The other 63.4 million of us can’t be bothered with the turnout of the game. We already have enough on our plates- what with food, commercials, and the sure-to-be-epic halftime show. No matter why we watch the game, and without regard to the fact that we spend our days habitually checking our mobile devices(about 80 times per day), we do still crave and treasure shared experiences. The Super Bowl is a time when people can get together in a festive, party atmosphere (whether or not your team is playing or winning for that matter) and hang out enjoying good ol’ human interaction. No matter the outcome- win or lose, So, win or lose, you can bet that when Super Bowl Sunday rolls around on February 3rd, Americans will be watching football, expecting something amazing to happen. It’s a gathering where everyone is emitting positive energy and waiting with great expectation. That’s what makes it a fun, memorable, irreplaceable staple in American culture.. That’s what makes the Super Bowl the event of the year. We’ve already established that the Super Bowl is the ultimate entertainment event. It’s not a concert where it only has meaning to the folks who go, or an awards show that only seems to have meaning if you saw the movies or know the artists who are being honored. It’s much different than that. It transcends age, economic, and cultural barriers. For people who stopped paying attention to music a decade ago (like me), or whose cinematic repertoire is now limited to the works of Pixar and Marvel Studios, the Super Bowl is sort of like the be all end all. It’s a mind-blowing experience for both the 70,000 fan in attendance, as well as for the 111 million Americans who don’t get to go to the game. The Super Bowl is only a half-century old. The first game was played in 1967 between the Green Bay Packers and then notorious rival the Kansas City Chiefs. Back then, you could get nosebleed seats for about $8 (or $60 in today’s money). Atlanta has promised to keep concession prices very low, but it you’re feeling fancy, $8 is how much you would pay for an ATL spicy chicken sausage at this year’s venue, The Mercedes-Benz Stadium.If you’re feeling really fancy, spend 11 bucks and get yourself a souvenir soda and a Mitchell Street Donut Dog. Yep. You read it right. Donut dog. Long John donut, bacon, jam, swiss cheese sauce. The works! 45 million celebrators will host Super Bowl Parties this year, and 69 million will be attendees. . Forbes. com positions the Super Bowl as a sort of Christmas for the food industry. Couldn’t have said it better myself. The Super Bowl is the second biggest food consumption day of the year, second only to Thanksgiving Day. Food makes up 79.5 percent of planned Super Bowl purchases, according to the National Retail Federation. The top sellers are the party staples - pizza, chicken wings, beer, soda, chips, salsa, guacamole. We love our food. Of the top-mentioned brands on Twitter during Super Bowl LII last February, five of them - Mountain Dew, Doritos, M&Ms, Skittles, and Pringles. Interestingly enough, in spite of all of the anticipated marketing campaigns, another one of the top brands, Avocados from Mexico. avocados and guac may be scarce, or even impossible to find come game day due to fuel shortages in Mexico that threaten to prevent shipments from entering the US. The next big category for Super Bowl spending is team apparel. This makes sense, of course! Who doesn’t want to rock their team gear? Of those polled, 11 percent of Super Bowl fans planned to buy team apparel and/or accessories to show support of their favorite teams and players. Buying team apparel makes up 10.7 percent of total Super Bowl spending, according to the National Retail Federation. This one actually surprised me. I always pictured a couch, a TV, and a table to hold snack bowls as the go-to Super Bowl party plan. I didn’t take into account that going to a Super Bowl party means you actually have to throw an epic Super Bowl party. Fifteen percent of Super Bowl fans polled listed hanging out with friends as the most important part of the evening, according to the National Retail Federation. Spending on decorations for these parties accounts for 8 percent of planned Super Bowl purchases. Of those polled, 27.2 percent planned to attend a Super Bowl party. Eighteen percent of celebrants were planning a party themselves. Five percent of viewers planned to watch the game from a bar or restaurant. Companies like Party City and OrientalTrading.com have actual Super Bowl party supply sections on their sites. Pinterest and Instagram posts from DIYers, crafts divas, mommy bloggers, food photographers, and chefs provide plenty of ideas for party decorating in the days before the game. Believe it or not, people actually buy new televisions for the Big Game. Super Bowl season is the best time of the year to buy a large-screen, high-definition, name brand TV, according to Kiplinger. Televisions also account for 7.7 percent of planned Super Bowl purchases. Shoppers can expect to get anywhere from 20 percent to 50 percent off the regular price of a state-of-the-art TV right around Super Bowl Sunday. . Finally, new furniture purchases account for $465 million, or 3.3 percent, of total consumer spending for the Super Bowl. January through mid-February is one of the best times of the year to get a good price on new furniture. This is one of two times in the year furniture retailers are liquidating their old inventory to make room for new models. Can Influencer Marketing Help You Reach Your Audience? So, a Super Bowl influencer marketing campaign is absolutely doable if you can find a way to market beyond the typical product placement post. Check out this post: 10 Social Media Strategies for Super Bowl Marketing. These are 10 ways we’ve seen on social that brands used to help improve visibility and engagement during before and immediately after the Super Bowl. that can get attention for your brand, even when your audience is temporarily obsessed with partying. For this post, I looked at a few timely Super Bowl-related ideas that are wide open for a great influencer marketing campaign. 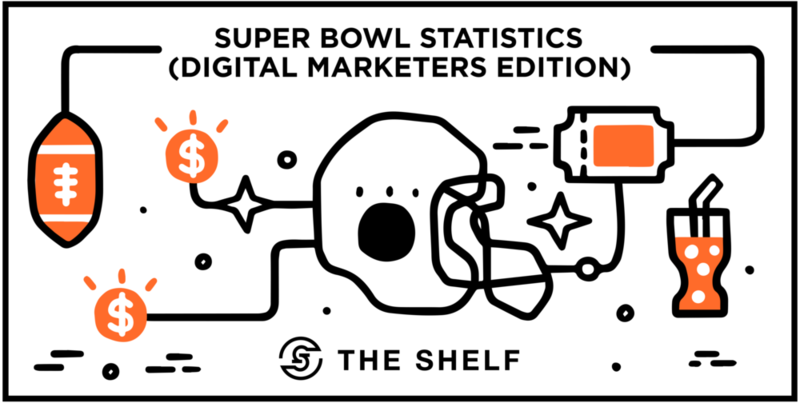 The goal here is to give you ideas on how you can leverage the Super Bowl conversations that are already happening across social, and especially on Instagram, and use them as the springboard for your campaign. If you don’t know what these are, snack stadiums are snack stations organized to look like football stadiums. Our latest search of the term reveals more than 2,900 Instagram posts tagged #snackstadium across Instagram. This one below was actually a Pinterest pin cross-posted to Instagram by Margie Romney-Aslett (@justagirl). A year ago, with the exception of Amazon’s post about Alec Baldwin’s snack stadium (it got 28.9K views and more than 2600 Likes), Margie’s snack stadium post is one of just a handful using the #snackstadium hashtag that got over 500 likes. This year, there are lots more contenders for most popular #snackstadium post. This one below was actually a Pinterest pin cross-posted to Instagram by @pinterest_diys_and_more. The beauty of the snack stadium is the possibilities inherent in designing one. Designers have flexibility in the foods they include as part of the stadium, as well as the materials they use to build the stadium. So, for instance, food manufacturers, nutrition brands, or health and fitness experts can target influencers to build a vegetarian stadium, or a low-carb keto stadium, or a stadium of salty snacks or sweet snacks. The options are endless. Lindsay (@cococakeland) posted a snack stadium (pictured below) that looks like it was built using the same foam poster board my daughter uses for school projects. Another stadium I found had 12-oz soda cans for exterior walls. Austria’s Faser.stoff actually manufactures corrugated cardboard that is perfect for building snack stadiums. Yet another Instagrammer posted a picture of a snack stadium made of paperboard magazine holders, the kind you can grab at Ikea or an office supply store. Snack food niche influencer (@hellthyjunkfood) posted a picture of a snack stadium made of sandwiches. No fancy construction materials, and zero waste. Just as there is an infinite number of snack combinations you can include in the snack stadium, there’s an infinite number of materials you can use to build one - construction paper to make the triangular flags, self-sticking letters to make the scoreboard, wood blocks to make the stands, coffee stirrers for goalposts, glue, staples, aluminum foil, you name it. DIY projects like building a snack stadium presents an opportunity for food brands, craft brands, office supply brands, and a thousand other brands to get in on the action in a way that’s timely and relevant. 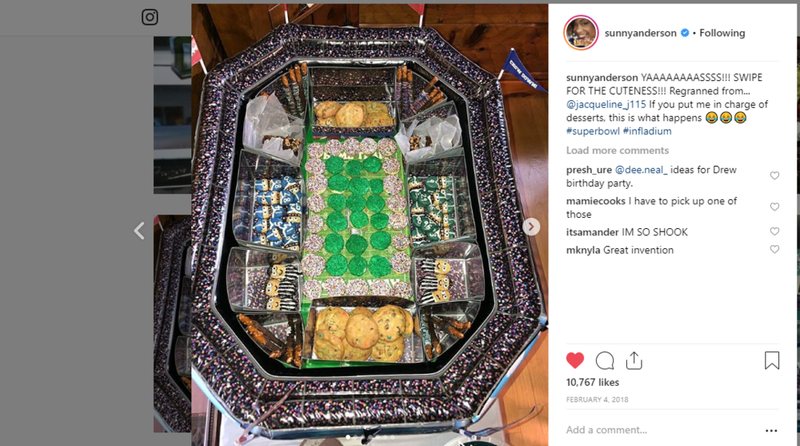 Food Network host Sunny Anderson (@sunnyanderson), creator of the Infladium (@infladium) reposted this adorable snack stadium filled with little football player shaped cookies. Jessica Burleson (@jacqueline_j115), the creative mind behind this design is an artsy lady who likes to have fun. The Infladium is available at Party City. Recipes are a dime a dozen, but specialty recipes always win. If you can tell me how I can live on Flaming Hot Cheetos like a college co-ed and stay on my low-carb diet, I will like your post, watch your video, and buy your magic potion. Diets never go out of style. Somewhere, someone is always cutting something out of their diet or adding something to their diet. Last week I made an avocado chocolate mousse. Coincidentally, I bought 32 ounces of frozen Welch’s avocados to create the high-fat, low-carb dessert. Why? I saw a post on Instagram one day and sort of stored that idea in the back of my mind for a rainy day. People do it all the time. If you can provide people with enough time to get the ingredients they need to make low-carb, vegan, vegetarian, diabetic, cholesterol-free, gallbladder diet, or whatever other specialty dishes they want to try for the Super Bowl, go for it. There were thousands of posts about Beyoncé after her halftime performance at Super Bowl 50, and thousands of Lady Gaga posts in the days following her halftime performance at Super Bowl LI. And how can we forget all the #JusticeForJanet posts after Justin Timberlake’s performance at Super Bowl LII? The Super Bowl halftime show has long-lasting impact. Before the show, performers are posting pictures of their arrival and the rehearsal. During the show, people are tuning in to watch.While just couple of years ago, Lady Gaga’s performance was the second most-watched Super Bowl halftime performance in history (second to Katy Perry’s 2015 performance), and it boosted total Super Bowl LI viewership numbers from 111.3 million to 117.5 million within 15 minutes. This year, things are drastically different. After some backlash from Atlanta natives it's been announced that in addition to Maroon 5, Big Boi (half of the duo OutKast, will also be performing at the halftime show. This year’s halftime show was particularly hard to book. Rihanna, Cardi B, and Pink all turned down the gig. While Pink cited problems in negotiations, Rihanna and Cardi B made it clear that they stand in solidarity with Colin Kaepernick, a former NFL quarterback who says he’s been blacklisted by the NFL for kneeling in protest to police brutality. Rapper Travis Scott also agreed to perform under one condition. Billboard reported that Scott would only perform if condition that the NFL agreed to donate half a million dollar to social activism group, Dream Corp. Even in the midst of all the halftime show woes, reviews will undoubtedly begin to pour in Instagram - of the performance, of the outfit, of the hair, of the makeup. And that’s where marketers can capitalize. For the 6.2 million folks who appeared and disappeared with Lady Gaga, they are a demographic that can be courted by brands in the days leading up to the big performance. For instance, a beauty company could partner with several expert makeup artists who have the skill to recreate celebrities’ looks with whatever tools they already have in their studios and live stream the transformation immediately following the performance. The influencer who comes the closest wins something cool. Brands may instead decide to give prizes to followers whose self-makeover is the most creative, or most dramatic transformation from the way they normally look. A contest like this could just as easily be sponsored by a skin care company as it can by a makeup brand or a wig company. Instagram user (@miarandria) posted a fun, flirty makeup tutorial for Super Bowl Sunday. Again, the point is the make the best use of the conversation already happening on social. Branding your product well is just as important as selling. When you’re marketing products like snacks and perfumes on social media, great branding makes the difference in whether you eventually get the sale. The sponsored post above from Jessica (@dessertswithbenefits) was one of nine I found for Boomchickapop during the days leading up to Super Bowl 50. All the sponsored posts for Boomchickapop were exciting and brightly colored. They were all product shots using the #BringtheBOOM hashtag. I clicked on all of them, actually hoping each post generated enough engagement to be included in this article. Just because the product packaging is so pretty. 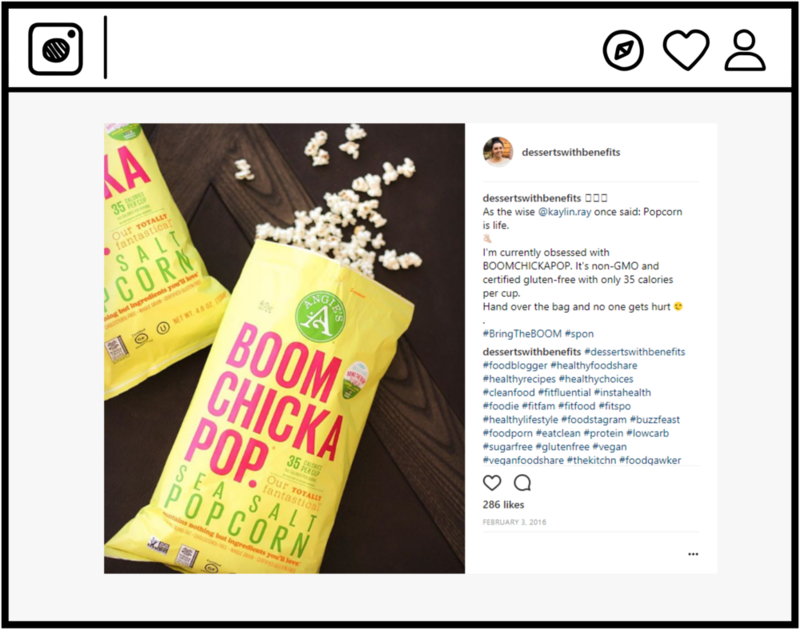 Use product posts like this one for Boomchickapop to build brand awareness, that way you don’t have to worry so much about converting Likes to sales. You still want to make sure to use influencers who can keep your engagement numbers above 1%. Your second option is to get more creative about your product placements. By that, I mean you can make your products utilitarian and steer the focus of your post to the actual influencer or a finished product (like a low-fat popcorn-only snack stadium filled with different Boomchickapop flavors. Or you can make your product presentation spectacular so your product looks like art. Compartes Gourmet Chocolates is a master at this technique. I’m going to talk more about their strategy in the next post. The post below from Karen (@thefoodchalatan) displayed a lovely dish that is based on Frito’s bean dip. This post was made in preparation for Super Bowl 53. Posts like this have the ability to convert to sales, and not to mention, this particular type of product ‘packaging’ is so pretty. The Super Bowl is the biggest event of the year. It gets more television views than any other programming and moves more than $14 billion. There are nearly as many women watching the Super Bowl as there are men (43 percent and 57 percent, respectively). And companies that buy TV ad spots during the Super Bowl are spending millions of dollars on ad spend, celebrity appearances, development, production, and promoting the spot before it airs on the big day. There is plenty of money to be spent, and plenty of money to be made if you have the right Influencer Marketing strategy. If you need help crafting a winning strategy that is just creative and interesting enough to be great, let us know. We have built thousands of successful influencer campaigns, and we’d love for you to become one of our many success stories. The Shelf is an influencer marketing company that designs and implements the highest performing campaigns in the lifestyle space (fashion, beauty, mommy, food, travel, home, DIY, health, and fitness). If you’re reading this post and wondering how to use Snapchat, Instagram, IGTV, Facebook, Pinterest and YouTube to get your brand in front of buyers, we’ve got you covered. Sign up for a demo to get your custom proposal.